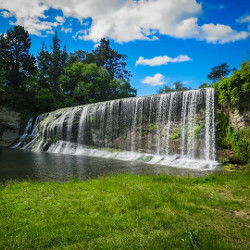 Gisborne is a city full of surprises; you will find everything from untouched wilderness areas, and historic landmarks to isolated beaches and world class wineries. Its relative isolation, once a barrier, has become an asset as tourists increasingly seek out untouched and uncrowded destinations. Gisborne enjoys a relaxed pace of life and is famous for its surfing beaches, in particular Makarori Point. Surfing, tramping, rafting, fishing, hunting, wind surfing, golfing and yachting are also well catered for. For the historians among us Gisborne offers good insight into the historical Maori culture of New Zealand; old traditions are still evident in many parts of the city and Kaiti Hill (Titirangi Reserve) is said to be where migrating Maori first landed when entering the area. Captain Cook also landed at Kaiti Beach on 9 October 1769 to his first encounter with the Maori people of the Gisborne region. Gisborne is simply brimming with fun places to explore and visit, here are our top picks. The Rere Rock Slide is not only the best fun thing to do in Gisborne it’s the best fun thing to do ever! This natural water slide is located in a section of the Rere River, 50 km along Wharekopae Road. Grab a boogie board or inflatable to protect you from the bumps and take the plunge down the 60 metre naturally formed rockslide and into the cool dark rock pool at the bottom. Levelled out by the constant running water of the Wharekopae River the slide provides the young and young at heart the ultimate wild ride! Remember to always stay safe around water and to preserve New Zealand’s pristine natural environment by never leaving anything behind except your foot prints. The Gisborne Olympic Pool complex offers seven separate pools, including a fun filled 98 metre hydro slide, diving, recreation, lane and toddlers pools and of course the hot therapy pool. Situated on Centennial Marine Drive opposite Midway Beach the pool complex provides fun filled entertainment for people of all ages and the perfect all weather fun-filled entertainment option. Also known as Kaiti Hill, the reserve is one of Gisborne’s most visited attractions, and for good reason. Steeped in historical and cultural significance the reserve was once a Maori pa site and it is understood that migrating Maori first landed nearby. Captain James Cook and his crew also came ashore at the base of Titirangi Reserve in October 1769. Within the reserve you will find four main lookouts (excellent for catching Gisborne’s famous first sunrise), an observatory, World War II gun emplacement, fitness course, playground and of course many fantastic places for a picnic. 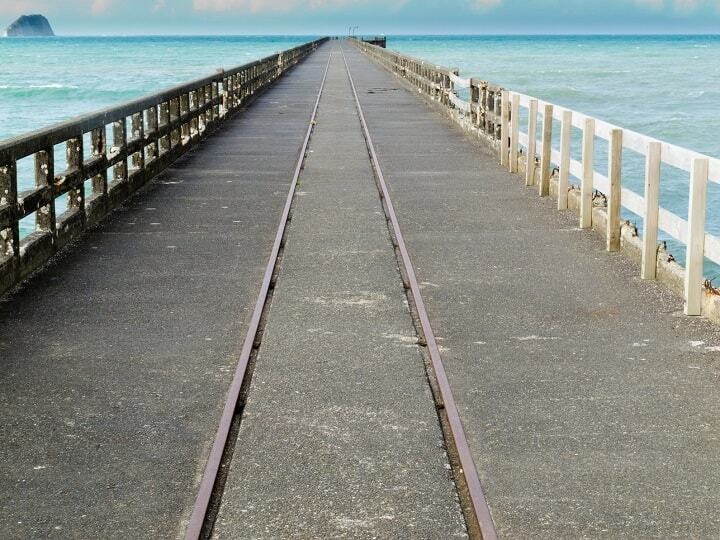 Approximately a 40 minute drive north of Gisborne is New Zealand’s longest pier. At 660 metres it takes around fifteen minutes to walk to the end, the wharf is a great place to take the kids fishing or just enjoy the open ocean views. Originally built in 1929 the wharf was intended to provide a place for large coastal ships to unload their cargo, but as road and land access improved it became unnecessary. Having recently undergone extensive restorative work the Tolaga Bay Wharf will be a fun part of the Gisborne landscape for many years to come. Gisborne is probably most popular for its great surf beaches. Head out to Makorori and Wainui beaches for the best surf. Famous for their superior surf conditions these beaches are highly recommended by the locals. Makorori Point is very popular with Longboarders, and the middle section of Wainui Beach by the surf club is perfect for swimming and boogie boarding, both areas are known to provide consistently good surf in all swells. The two beaches are definitely well worth a visit whether you are a surfer or not. Gisborne is a vibrant city full of unique buildings; home to New Zealand’s oldest European cottage, Wyllie Cottage, which was built in 1912, Gisborne provides an authentic taste of New Zealand historic culture while still presenting a modern selection of popular shopping and dining choices. Enjoy a stroll along the waterfront or through the inner harbour area, renowned for its restaurants, cafés and bars. Or head over to the Gisborne Wine Centre where you can sample some of the local wines or book a local winery tour. Home to the Wa165 steam locomotive, the only remaining working Wa class train in the world today. Built in Dunedin in 1897, the Wa165 was used mainly as a locomotive on the heavily graded railway line between Gisborne and Motuhora. The Wa165 is now retired but comes out for special steam trips now and then. Highlights are travelling in the train across the local airport (the only train to do so in the southern hemisphere) and the spectacular beach and cliff scenery, providing the perfect opportunity for some amazing photographs. Gisborne’s exquisite lakes, bushland, streams and golden beaches have become a haven for all types of wilderness seekers. From adrenaline adventure activities to a relaxing day out, you will find something to suit everyone in the city of Gisborne.